Four of us sat in the musty compartment as the train rattled southeast from London’s Victoria towards Canterbury. We were a strange mix of characters, brought together that morning because we were all part-time tutors at Canterbury College of Art. I was supplementing my meagre postgraduate allowance by introducing architecture and graphic design students to these whacky machines called computers, which, in 1980 had yet to have any noticeable impact on their lives. For a graphic designer this seemed an entirely logical innovation, but not for CBS who insisted that it should have a pronounceable name. Like George Orwell with his “Newspeak” in “Nineteen Eighty-Four”, CBS obviously believed that if something cannot be said, it cannot be thought (check out the Sapir-Whorf Hypothesis). To say nothing of the problem of where you would find an album by a band without a name in a traditional record shop (how we bought music at the time). They came up with “Freur” – a kind of onomatopoeic expression of the symbol. 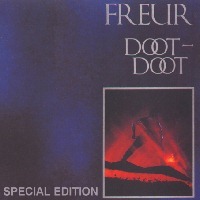 I’m listening to that first album “Doot-Doot” now. It’s great. I went on to help them with some cheesy computer graphics running on a Commodore64 for a gig at the London School of Economics. Whilst smells and music may be hugely evocative for us, bringing back strong, emotive memories, we need words to hang complex ideas onto. Diagrams may help us to understand complex ideas, but the language that we use so affects what we can recollect that we need a word or phrase to associate with the idea. Why is any of this important to new product development? Well, if your product really is “new” rather than a rehash of what has gone before (“an iPod but with…”), then you are going to need to be pretty clever in describing it to other people. Describing it by association has big pitfalls because one person may remember one set of associations, and another a different set. You might have compared it with the iPod because it was “white and cool”, they might have heard “wheelie interface idea”. Once you have their attention and have managed to get the idea across in a way that means something to them, you then need to give them a hook to remember it by: a name. Without this you’ll be revisiting that tortured explanation in every discussion. That is what is powerful about “personas”, isn’t it? That you have a simple, easily communicated hook, “Sid Smartypants”, to hang a complex set of ideas on. Use alliteration, simile, concatenation, onomatopoeia or a portmanteau. Use words from a different language. Find something memorable without too much other baggage attached to it. Keep it simple, keep it clean. If the concept makes it into a project then the name is going to be littered through documents and code, so bear that in mind. A good codename is going to help to rally the troops around the objective, it could convey an air of secrecy and importance, and it could help keep visitors from picking up on what you are up to. For instance on a visit to Industrial Light & Magic (code named Kerner Optical – it was even on the plate glass front door when I first visited), I was led down a corridor as doors were shut ahead of me to arrest my prying eyes. I’d gone to talk to them about a top secret new project which they would only refer to mysteriously as “JP”. At the end of the visit after we’d talked about all their technical requirements for our paint system “Matador”, they invited me to see some line tests. I sat in a small closed office with one of their animators who showed me a line test of a Tyrannosaurus walking and running. I went back to SFO wondering about the project and was still wondering as I walked through Heathrow hours later. As I walked past a bookstore a new paperback jumped out at me: “Jurassic Park”. This entry was posted in imagine and tagged fun, Matador, product management, vision. Bookmark the permalink.